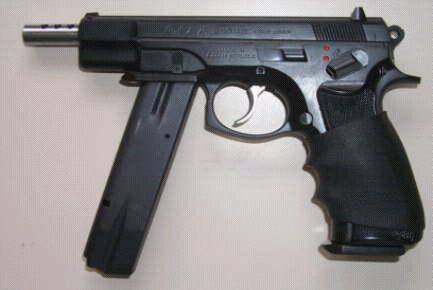 The CZ 75 Full-Auto is a PDW variant of the CZ 75 Export model. Developed as a Personal Defense Weapon for non-combatant army personnel it features a stroboscopic compensated barrel and trigger group for single shot or full-autofire. This weapon fires the standard NATO 9x19mm Parabellum cartridges. Notice that foregrip: it is just a spare magazine, inserted on a special site in the frame making it ready to use in case of an emergency.